We had a chance to meet with Wilocity to take a look at their progress in bringing WiGig to market. Let’s start with a primer. WiGig (802.11ad) is an air interface that operates in the 60GHz range, providing massive bandwidth and some keen tech to eliminate crowding issues that are seen in 2.4GHz protocols. At such a high frequency, though, propagation is rather limited. So, though some provisions for bouncing signals around a corner are made, this is meant primarily as a line of sight interface. So what can you accomplish with WiGig? Let’s look at the demos. Wilocity has fleshed out two routes for using WiGig, a networking protocol and a bus replacement. With a WiGig module installed in your device (tablet/PC at present) you can utilize multiple peripherals connected to a WiGig enabled dock. Your computer will detect these peripherals as connected through a PCI Express bus, and with so much bandwidth available, no penalty is paid versus having the peripheral connected to a wired PCI Express lane. The low latency lends itself to video and gaming applications. This is truly a wire replacement solution, and though it is limited to in-room experience, it’s still better than dragging cables around. The networking solution WiGig has developed is impressive, though its current state is better suited to the office than the home. Businesses that handle large files are often at the mercy of wired connections to rapidly move files between users. Though WiFi speeds are improving, and 802.11ac is finally starting to trickle out, maximum throughput is still achieved on GigE connections alone. Configuring a WiGig network over a bank of cubicles, though, would allow each client to receive greater than GigE speeds with just a few access points, and without interfering with other wireless products and devices. Wilocity’s solution uses 802.11ac as a fall back and when operating beyond line of sight, and does so seamlessly. Display mirroring using a WiGig enabled dock and tablet. That need for line of sight limits its appeal to closed environments, such as in the home, but as a value add, having an 802.11ac access point that also provides WiGig throughput in the same room as the router, there could be applications for media centers and home offices. 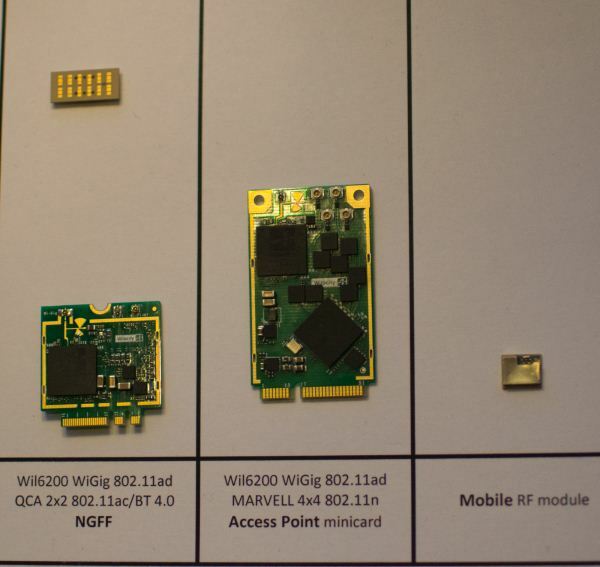 In addition to the demos, Wilocity showed off its recently updated module (built in partnership with Qualcomm Atheros), now upgraded from 802.11n to ac, and featuring a new, smaller RF module that has 32 individual elements arranged in an almost omnidirectional fashion to improve performance. Marvell also has a new access point module, with 4x4 802.11n. Products featuring these module should be released this year, and the road map for the next few years continues this trend of improving service while shrinking the module size down further. 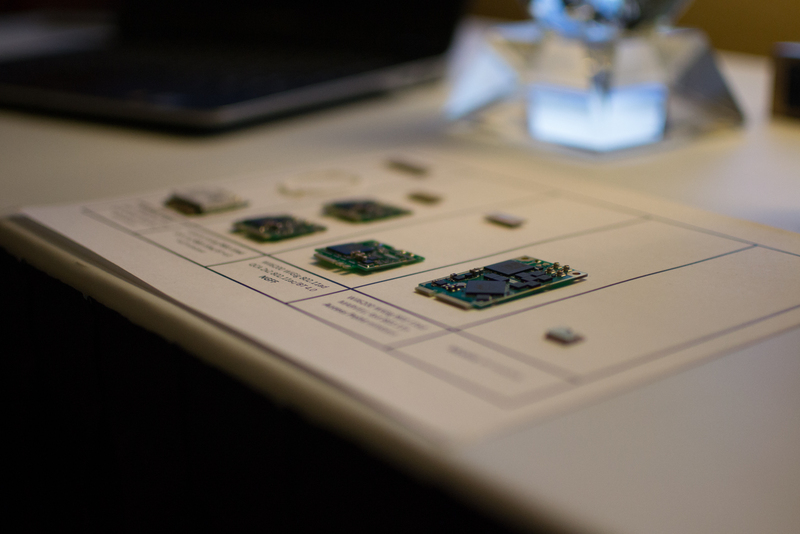 Ultimately they would like to see a component small enough to be embedded in a handset. 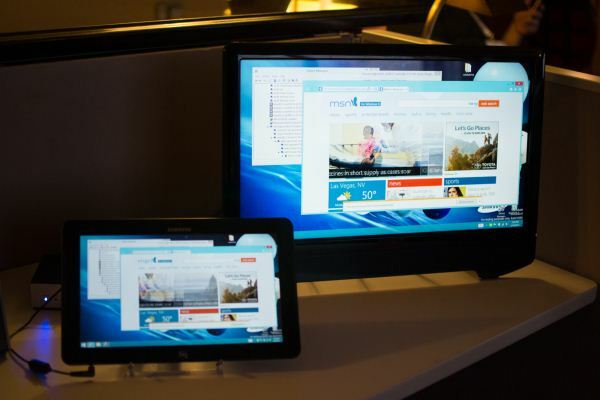 They expect the first WiGig equipped handsets to premiere in 2014, with mass production in 2015. For now, we’ll be on the look out for any WiGig devices that are ready to be run through their paces. I like the move to other frequencies, but I have enough problems with WiFi penetrating walls with 802.11a @ 5GHz. One floor up and less than 20 ft away, I'm getting no better speeds than 802.11n even with 2.4GHz being extremely crowded. 802.11a is only 54 Mbps. Given similar signal strength, 802.11ac will be much faster. If anything it is impressive that your 802.11a connection is as good as your n connection. Either that or it proves just how pathetic and useless the 2.4 GHz spectrum is becoming. Honestly, I really wish someone in the industry would define WTF is seamlessly. Because most of the time they are not seamless at all. What I rally want this to be is in integration with wired networks and a module that transforms the wired signal in the outlet (or a switch for that matter).